No, wait! I’m not ready yet! I don’t fear falling. I fear no one being there to catch me before I hit the ground. In 2003, I was learning to do a handstand. I mastered doing it against a wall very quickly but for obvious reasons I didn’t have the guts to do it without wall support. 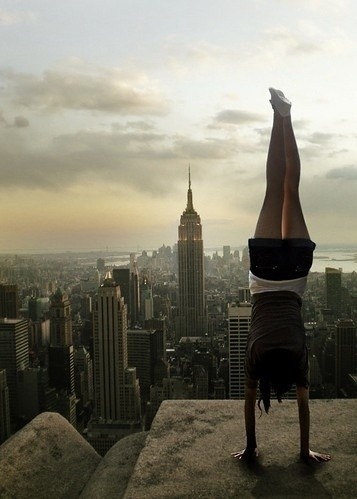 As everyone knows, a handstand is nothing if not done well in confidence and more importantly, it should be done independently from any form of outward assistance. I realized I needed an extra pair of hands so I rallied my fellow prefect after school to ask her to be my spotter. The plan was for me to go into a handstand and she would act as a wall by grabbing my ankles to keep me in a straight vertical position and when I felt comfortable enough supporting myself, she would release and step away leaving me in a perfect handstand. If my body wavered, she’s be right in front of me to stabilize me . We found a deserted corridor in the highest level of the high school’s Block B to practice. I got into a Warrior 1 position. She stood about 4 feet away from me and stretched out her arms in front of her. A little nervous, I sought reassurance from her about 100 times before she got extremely annoyed by my lack of trust in her. She sidestepped quickly against the wall while my legs, now moving to complete an unexpected full circle at maximum momentum, sailed past her flailing helplessly before I heard it. The deafening sound of my bone crack mercilessly against the steel-cold cement floor as my fall reverberated through the entire block. More than wind got knocked out of me that afternoon. 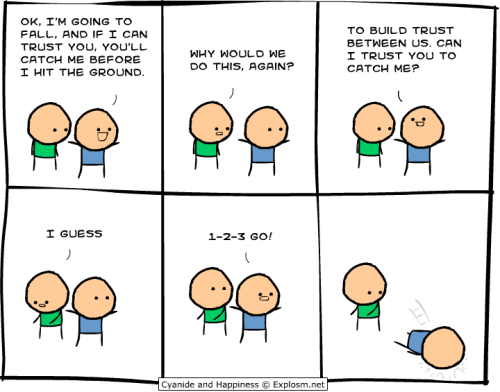 Trusting is no easy feat. Especially with a stranger. However, Jesus is no stranger and has never done anything to render any distrust from me. Quite on the contrary, He has been nothing if not faithful from the start. Yet, at times I chose to treat Him as I would have if a random came up to me and asked me to free fall blindfolded into his arms. That being said, I’ve been strongly challenged this past week to revise my trust in Him. Everyday I encountered situations in which my trust in Him and His word over my life was put to the test. I’m overjoyed to say there was fairly substantial progress. I find comfort now knowing that even if for whatever reason I couldn’t completely trust any one person, at least I’d be able to trust Him wholeheartedly. If you ask me now, I would cannonball off a cliff into His arms. With eyes wide open. And a smile on my face. Dear Jesus, we put the US in TRUST, baby. Wiki side note: In yoga, the handstand is known as Adho Mukha Vrksasana translating to Downward-facing Tree Pose. P.S. I still can’t do a handstand without the support of a wall. In need of another spotter. Thinking of: This sudden influx of old forgotten friends, Bananeira, Charlize Theron in Æon Flux, Gym Class Heroes’ A** Back Home, Mikaila’s So in Love with Two and how I really need to learn to trust my own self.